Travel warnings are a tricky business. Too broad or heavy-handed, and officials run the risk of alarmism and economic damage; too light and they can be cast as negligent. Against this backdrop, US government health officials are defending their latest travel guidance. On Aug. 1, the Centers for Disease Control and Prevention advised pregnant women not to go to a Miami neighborhood where new, confirmed cases of Zika virus that appeared to be locally transmitted were reported. It was the first time the government health agency tasked with preventing the spread of disease has issued such an advisory for the Zika virus within the 48 contiguous US states, and it appeared to be the first time the CDC has warned against visiting any part of the continental United States for health reasons. The warning applied to a one-square-mile area north of downtown Miami. The Aedes aegypti mosquito that transmits the disease doesn’t travel more than 150 meters (492 feet) in its lifetime, “so there wouldn’t be a technical or scientific basis to give a broader recommendation,” said CDC director Tom Frieden. Despite the narrowness of the warning, it may be problematic for Florida’s important tourism industry. The state drew in more than 100 million visitors and generated more than $89 billion of economic activity last year, according to Florida’s tourism board. 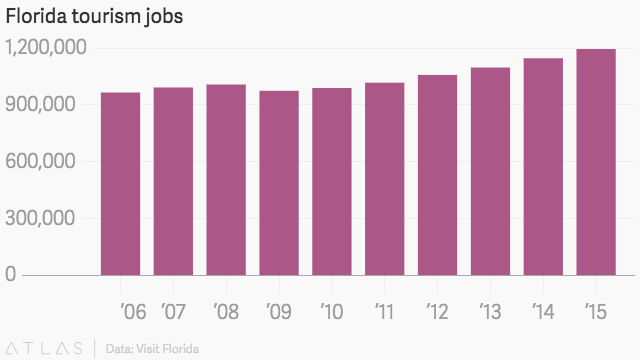 But Florida’s tourism business already has shown signs of weakening that predate the Zika warning. Occupancy rates for Florida hotels averaged 75.3% in the first half of 2016, a decline of 0.8% from the same period a year earlier. It marked the first time in at least five years that the state posted a decline for the first six months of the year, according to hotel analytics firm STR. Now, companies that cater to travelers, like hotels and airlines, may have to be more lenient to accommodate skittish travelers, even those who aren’t planning to visit the area where the Zika virus is suspected to have been transmitted. For example, JetBlue said travelers booked on flights on or before Aug. 1 to areas the CDC says are affected by Zika can get a refund or will be able to change travel dates or destinations. Of course, JetBlue does not fly into the Wynwood arts district where CDC identified the latest cases—it flies into Miami International Airport, more than 7 miles away. That could mean fewer travelers to Miami altogether. While it’s too early to quantify what the impact of the CDC’s warning will be, there already are some challenges in combatting the spread of the disease. The CDC’s Frieden said officials have noticed new populations of Aedes aegypti, which could mean the insects are resistant to recent insecticide sprayings. To the extent that this scares off domestic tourists, the effects could be widespread. 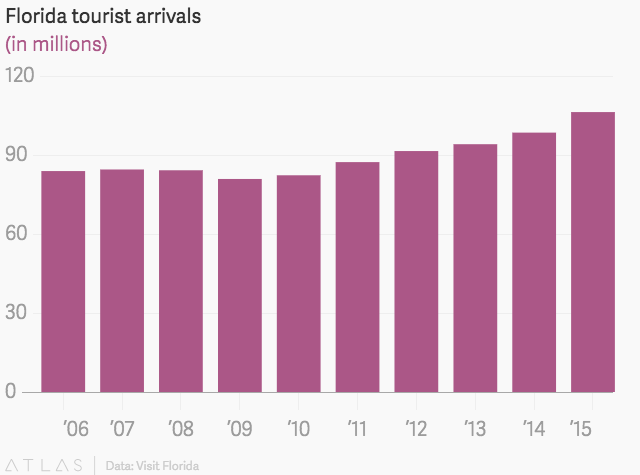 Tourists from within the United States account for more than 85% of Florida’s visitors, and their continued business will be crucial to the state following a drop in visitors last year from economically challenged countries like Brazil, Canada, and Venezuela.